“Stepping out of India again? Don’t you miss it?” The lady at the Delhi international airport asked, a little baffled at my peregrinations. I smiled for an answer but as I lay in the utterly comfortable blue flat bed of the Finnair aircraft, that remark set me thinking. Every time the aircraft cuts through the fluffy clouds and takes me to another clime, I miss home – the vibrant colours, that cardamom-laden curry, the warmth, the music. Thankfully, at 30,000 ft above there was music and good food; Channel 7 had my favourite Sufi music and the stewardess in powder-blue sheath had left a sumptuous curry for dinner. I thought of the next Finnair flight from Helsinki that would take me to Slovenia’s capital Ljubljana. For the next five days I would miss everything Indian. I cringed at the thought. But boy! could I have been more wrong. It is evening in beautiful Ljubljana, where, they say, all of Europe meets. The famous Preseren Square is bustling with people, some just lazing by the church, others hurrying home to family and hearth, still others stepping out to enjoy an evening under the stars. Stars are glittering in the dark sky and a river seems tired after the day’s choppiness. And I am hungry. I walk around the Triple Bridge looking for a good meal only to stumble upon a board that read Namaste, Indian Restaurant. I thought I was hallucinating. An Indian restaurant in Ljubljana seemed so far-fetched! As I walked closer, I could see the orange light and in the air was a familiar aroma. Namaste opened its doors two years ago, but ask Vesna Nisha Dolinar, the restaurant owner, and she would trace back her Slovenian connection to her father Gosalia Jayantilal, who, in 1960, packed his bags and travelled from Gujarat to Ljubljana as the first Indian student in Slovenia. Gosalia was an exchange student, but he stayed on long enough to bring his wife Kokila. Kokila might not have known Slovene but she created a lot of buzz with her sari. Not many Slovenians had seen the six-yard sari draped gracefully around a woman and they were completely enamoured. That prompted the Jayantilals to introduce Indian culinary delights and handicrafts in Slovenia. The exotic food and craft had the city enthralled. However, when Jayantilal decided to return to India, Kokila stayed back, married a Slovene and opened Sariko, a popular shop that now sells Indian handicraft and textile in seven Slovenian cities. Nisha was not sure about her tryst with the country that her parents had adopted as their own; she studied Communications and Public Relations in San Jose, California. But Destiny had already ordained a choice for her. On a holiday in a Croatian island, Nisha met a Slovene, fell in love, returned to Slovenia and as the bard said, lives happily ever after in Ljubljana. As Nisha stands in the restaurant’s kitchen to ensure that the kebabs skewered in the charcoal oven are as succulent and the naans as flaky as they are purported to be, she looks back with nostalgia at all the summer and winter vacations that she spent with her parents in Mumbai. “I love going back to India,” she asserts. With the crowd milling in her Indian restaurants in Ljubljana and Maribor, Nisha can no longer borrow so much time off her packed days to head back to India, but she chips in every effort to give the Slovene a traditional north Indian lavish meal. Standing by the stairs of Namaste, I thought that is all the Indian vignettes that I would have to subsist on for the next four days. But not too far I saw a poster of a meditation camp by Sant Baljit Singh. That night as my knees turned wobbly with all the walking, I sat in the City Square. But the mellifluous strain of the harmonium distracted me, I did not hear hallelujahs being sung to Jesus instead I could hear a bhajan invoking Lord Krishna. As if on cue I walk towards the music. There were Krishna devotees in the traditional dhoti and tilak, women in bright sarees, singing hymns to their favourite deity – Krishna. There is a crowd around them, I stand still, mesmerized the devotion of the Slovenes. One of the bhakts walks up to me and says, “If you are here for another day, you must eat at our Govinda restaurant.” I was touched by his generosity. It felt like family. Four days later as I lay in the flat bed on the Finnair flight from Helsinki that would bring me back home, I was listening to my favourite Sufi music and thought of Jayantilal who came to Slovenia 48 years ago as the first Indian student and of Nisha who keeps the Indian tradition alive in her restaurant Namaste and the Sariko shops. As the aircraft soared, I also counted the Indian vignettes that I was taking back to India. 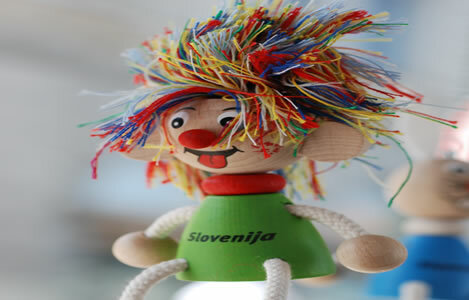 The vignettes that I had picked sedulously in Slovenia.